How do I know what type to get? I would always start with evaluating what purpose the earbud is being used for. Is it for work? Is it for the gym? Is it for jogging? Are you going to be using with a phone to make a hands free device? Every different type of earbud offers unique features. For example, if you’re going to be using the earbuds while jogging, you may want to look for something that is attached to an ear hanger. The impact of feet hitting pavement can destabilize an earbud and force constant readjustment. Are they difficult to keep clean? Like anything that goes on your body, earbuds needs to be maintained and cleaned to ensure their longevity and quality. Loudphile posted a great all-inclusive method for cleaning earbuds. Are earbuds more damaging to hearing than other types of headphones? The short answer is maybe. There haven’t been any comprehensive studies to definitively say yes or no. However, there are studies on the fact that when people lose cochlear nerve fibers, they lose hearing (Source). Many auditory specialists say to avoid this damage it is best for ear devices to be lower than 60% and people should only use them for maximum 60 minutes per day (Source). By todays’ standards that’s a pretty insubstantial amount of time per day and a fairly low volume. Especially when taking into consideration people’s tendency to crank up the volume to block out all other noise. Still, these are factors to consider before the purchase of a pair of earbuds. Many people will find this a great companion for their work outs. Aside from being wireless with a nine hour battery life, these buds are also sweat resistant. Additionally, the trademarked FlexSport collar keeps the earbuds fixed, but comfortable. Because the design of this particular style means it has direct rigid contact with your neck, there is a lot of product related noise that reverberates up the cords into the buds. Generally, these are going to be an everyday type of earbud. They have an 8 hour battery life, noise isolation, and a flexible collar to keep it comfy. We’ve all experienced the harrowing moment of pulling an earbud out after it’s suctioned to your ear. It’s loud and a little gross. The Ink’d lacks the moisture control features of some of the other earbuds, so they are more prone to suctioning. This is your feature packed earbud option. It has a seven hour battery life, a removable flexible collar for when you don’t want that rigid feel of the collar, and two rubber application options to try and achieve the best fit for your ear. This model of earbud has the shortest battery life, this can be inconvenient if you’re the type to use your earbuds for an extended time. 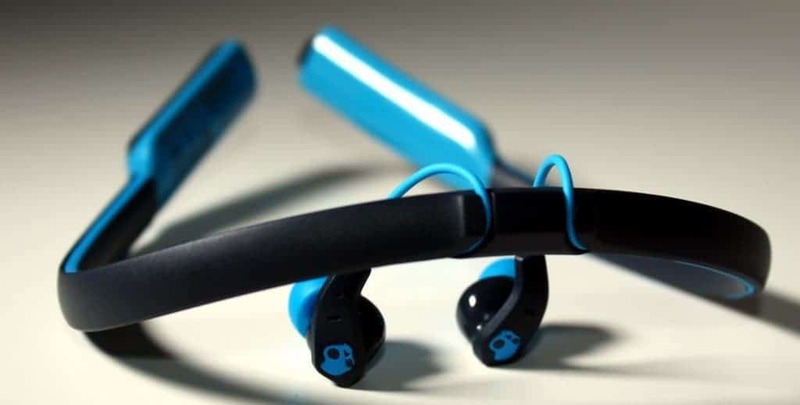 Chops are what I see as the jogger friendly earbud. They have an adjustable ear hanger to make sure the motions of jogging don't shake them loose. They’re also moisture resistant to help prevent any hair raising suctioning. These are a corded earbud and as a result can be a little cumbersome when trying to navigate the cord, device, motion trifecta. They also lack an anti-tangle cord. This model is for people who need the security of a nice fit, but hate the feel of an over the ear hanger. The XTPlyo has TripleLock technology to hold its sweat resistant bud tight in the ear by creating an additional point of contact in the bowl of the ear. Like the earbud before it, this earbud is corded and can be awkward to deal with. It also does not feature a tangle proof cord. Overall, the ﻿﻿Sm﻿﻿o﻿﻿﻿kin﻿﻿﻿﻿’ ﻿﻿Buds﻿﻿ ﻿﻿2 offer the most functional features while still providing options to make them customized for every individual person who uses them. As a multi-faceted earbud for the everyday person, they definitely can provide the most utility. These earbuds are excellent for lucid dreaming. Secrets of lucid dreaming and how to control your dreams?